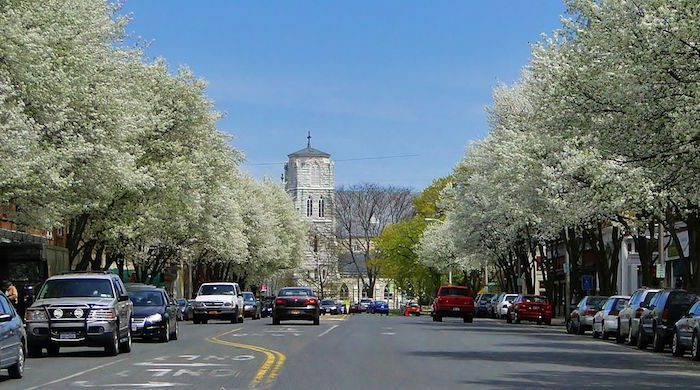 Located in the Southern Berkshires near the Connecticut border, Great Barrington is a tiny but trendy village known for its vibrant arts and food scene (including the inspiration for the Arlo Guthrie hit Alice’s Restaurant). The town center is classic New England — all brick storefronts and beautiful steeples — with a path lining the Housatonic River. We’ve mapped out a couple of nice routes. Enjoy a quick 1 mile loop along the River Walk trail. Park downtown. The River Walk Upstream starts just behind the Rite Aid. Follow the trail until it merges with Dresser Ave. It will then merge back along the River until Bridge Street (after passing W.E.B. Du Bois’ birthplace). Cross over the bridge and return on Main Street. For a lovely 4.8 mile loop, take Castle Hill, around Bard College and returning via Lake Mansfield along Fox Run. There are great options to finish off your run with a visit to any one of Great Barrington’s eclectic eateries. If you can make it on a Saturday, there’s also a terrific Farmers Market in the center of town. 4.8 miles loop; For a shorter run, just do the main section of town and River Walk.